Hopefully this will be my last change but it’s worth checking this post before kick off tomorrow. Should Shaw not start, I’m likely to change my team at the last minute. It’s worth noting that some of these players are simply placeholders. I’ve indicated below players who I’m definitely starting with and for the others, alternative options for each position. Hart – the price is too tempting to skip this one. Hart won’t have moved to be happy sat on the bench and will hopefully get an immediate chance at Burnley (who have extra fixtures) with injuries to Heaton and Pope. Alternatives for this position could be Caballero (if Chelsea lose Courtois and fail to replace), whoever Chelsea replace Courtois with or Leno/Cech. Robertson – certain choice, for the reasons below. Shaw – certain choice, for the reasons below. If he starts on Friday. Keeping 0.5m in the bank in case Young takes his position. Mendy – I’ve switched from Otamendi because I think there is more competition for centre back places and hopefully Mendy will push forward. I’m not certain on this position yet. I know I want it to be a Man City defender but may opt for the cheaper Stones or back to Otamendi. Lowton – Burnley should have extra fixtures in August and did well defensively last season. I’ve got some funds in the bank should I want to upgrade him to a 3m defender in the form of Luiz or D. Sanchez. However I’d like to see how these two get on before including one of them. Mane – too big of a goal threat to leave out. I wasn’t happy with him being missing from my previous draft so I’ve accommated him in this one. This position could be switched between Mane or Hazard by ensuring space for a 6m midfielder. Mahrez – good price at 4m but if I go for B. Silva, I may get some Chelsea coverage in and go for Willian instead of Mahrez. B. Silva – I’ve had my doubts about Keita. For an extra 0.5m I thought Silva may be worth a punt. He played well in the Charity Shield so could be a safer bet than the unknown Keita. Salah – certain choice, for the reasons below. Aguero – certain choice. It’s only one game but getting on the score sheet twice against Chelsea has drawn my attention to Aguero. I’ve never left him out of my starting team and he always scores well. It’s hard to justify leaving him out this time around. Aubameyang – at the moment it’s Aubameyang. However I’ve left enough in the bank for this to be Kane. I may equally go with Sanchez. Ultimately the position is reserved for Kane but I’d like to get off to a strong start. A lot of the positions I’ve left fairly open at this stage. I’d like to see what happens with the goalkeeping situation at Chelsea before settling on a final team. I like the flexibility that’s built into the team outlined. I’ve got 3m in the bank meaning Kane can be put in at any point. It also leaves me 0.5m to upgrade Shaw, Lowton, Hart or B. Silva. Should I take Aguero out for Kane, this leaves another 1m in the bank to play with these positions as well. As we are coming to the decision date, any thoughts would be greatly appreciated below. Robertson – still one of the first names on my team sheet. 3m for someone who I’m hoping will be a regular at Liverpool is a bargain. Otamendi – high price at 4m but based on his points total from last season could be a good investment. I’d ideally like to save some funds here so I’ll be looking at who is getting a regular game for City and if I can find a cheaper alternative I’ll probably switch this at some point. Tarkowski – scored well last season and is cheap at 3m. Also should have additional games in August. May replace him after these games. For someone like Sanchez at Spurs. Shaw – we can check Man Utd’s starting team against Leicester before we submit our final teams. If Shaw starts I will put him in because he’s cheap. I’ve left 0.5m in the bank to bring in Young, should he take Shaw’s place. Mahrez – good price at 4m based on him being a consistent point scorer. Hoping he quickly recovers from his ankle injury. Sane – scored over 200 points last season, high ownership for this season, 1m cheaper than Mane, Hazard, Sterling, etc. Keita – the biggest risk in this team selection. I’d much rather have Mane but funds won’t allow it. Last season I went with two cheap defenders to try and accommodate too many high value attacking options. I’m trying to avoid making the same mistake twice by going for Keita – hoping that he’s a bargain at 3m. Kane – based on his goalscoring record and previous points totas he could be essential this season. He’s also favourite for top goalscorer in the Premier League. Salah – hard to make a case to exclude him after last season. Aubameyang – at the moment I’m favouring Aubameyang despite Arsenal having some trick fixtures to start. He ended the season well and he looks like he’s going to be the main man at Arsenal. I can see him scoring a lot of goals this season. My only concern is that Lacazette may play more central and he’s much cheaper at only 4m. I also don’t like to exclude Lukaku. 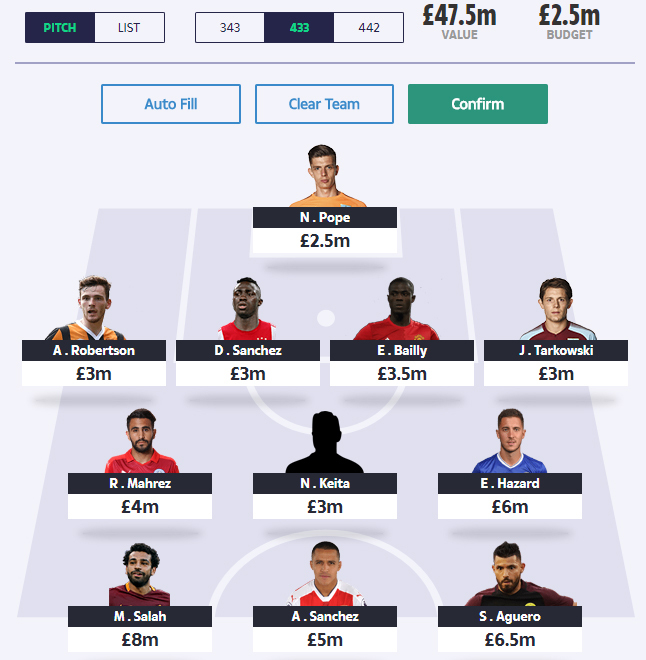 As a result I’ve left 0.5m in the bank should I want to make any changes to this position. I’m fairly sure this won’t be my final team. However I’m fairly happy with it at this point in time. I think it’s a solid basis to start from and I’ve built in budget for positions where I might need to change things – Shaw to Young, Heaton to Leno, Aubameyang to Lukaku. My biggest issue and it’s a fairly big issue for me, is Keita. It’s not that I don’t have faith in him doing well. It’s more the issue of if he gets injured or doesn’t become a regular, that 3m is a long way from 6m if I wanted to bring in Mane or Hazard. Not having a plan for either of these two players is really bothering me and I can’t decide if this is a fundamental problem with the team. It’s something I’ll need to ponder for a bit longer. The only places I can see where I could free up the funds for this is by not having either Salah or Kane or weakening the defence. I don’t really want to do either of these things. Having had some time to ponder over my initial team selection, I’ve decided to come up with a shortlist of players I’m considering for each position. The team shown below was a very quick attempt at an initial team as a result of player values being released. I now need to take a step back from it and almost start again with a shortlist of players for consideration (in current priority order). Pope – cheap option, hit over 100 points last season. Best value keeper based on points per 1m spent. Drawback is he might not play in Europe. Leno – slightly more expensive but playing in a top 6 team. Also probably won’t play in Europe. From a goalkeeping perspective I’m also keeping my eye on Chelsea. Should Courtois move on and be replaced by someone like Schmeichel who is valued at 3m, I’ll almost certainly go for this option. Robertson – at 3m for someone who I’m hoping will be a regular in a top 4 team this is a bargain. Definitely going in my team. Otamendi – high price at 4m but based on his points total from last season could be a good buy. Hopefully he gets as much game time this season but I think having a regular Man City defender is essential. Shaw – we have the opportunity to look at Man Utd’s starting lineup before they kick off against Leicester. If Shaw starts I may put him in because he’s cheap. I may then leave 0.5m in the bank for Young, should Young take Shaw’s place in the long run. Both are cheap in a team who kept a lot of clean sheets last season. Tarkowski – scored well last season and is cheap at 3m. Also has additional games in August. May replace after these games if chosen to start. Smalling – expensive but should be a regular at Man Utd. Sanchez – one to watch before prices change. Cheap if he becomes a regular starter. Christensen – one to watch at 2.5m. If he gets a regular start could be a bargain. Kolasinac – very cheap at 2.5m if he gets regular game time. Not sure he will though. Mahrez – at 4m looked a bargain based on points scored last season and a move to Man City. Almost certainly in my team to start. Mane – expensive at 6m but could be capable of having a very high point scoring season. Hazard – should he still be at Chelsea for the start of the season he’s difficult to ignore. Always gets a huge final points total. Keita – his 3m price tag draws me to him. Could save a decent amount of money to spend elsewhere if he hits the ground running. Question marks against how often he will play and how many goals he might get. Willian – good price at 4m for another player who scored well last season. However there’s a lot going on at Chelsea with question marks against his future. Arnautovic – West Ham have strengthened and Arnautovic plays as pretty much a striker. This didn’t return a huge number of points last season but if West Ham were to start the new season with a bang he could well get off to a flying start. Jorginho – I don’t know much about him but based on his price he could be a good cheaper option. For me he’s unproven in the Premier League and it’s hard to predict how well Chelsea will do this season. Kane – goes without saying. When he’s starting again he could be essential. He’s favourite for top goalscorer in the Premier League. Aubameyang – good price for a striker who finished the season well. Only question mark is against how well Arsenal will do this year. Sanchez – cheap at 5m but not sure he will play through the middle so may not be Man Utd’s biggest goal threat. Lukaku – fairly expensive but should be Man Utd’s out and out goalscorer. Likely to miss the start of the season though. Aguero – hard to ignore due to his previous goal scoring records. Bit pricey at 6.5m though. Could be worth saving 1m by going for Aubameyang who may score a similar amount of points in total. That’s my current shortlist. The issue I’m facing is I can’t accommodate the players at the top of the list for each position within the budget allowed currently. As a result I’m trying to decide which players from lower down each list to bring in to free up some budget. With team selection and player prices launched yesterday, this gave me the first opportunity to start building a team around the 50m budget. I’ve defenders appear to be much cheaper this time around with some real bargain available. Below are my thoughts on team selection to date. This is likely to change dramatically before the start of the season, I’ve also rated each player out of 10 based on how happy I am to include them. This takes into account the player’s value, August fixtures and likelihood to score well over the season. Some players are only included as place holders and are certain to change. – Last season my defence was weak, I think this was a mistake. – Pretty much all of the highest scoring players last season came from the top 5/6 clubs in the Premier League. It’s vital to get players from these clubs. – Consider players who are likely to be rested for the start of the season after a long World Cup. – Keep a decent amount in the bank to ensure premium players who are being rested can be afforded – Kane at 8m. – Burnley have two additional fixtures in August. – I’ve left money in the bank for Kane. I’ve only left him out because I think he will be given a longer break after the World Cup. – Other players I’m looking at and still considering are Mane, Aubameyang (good price but Arsenal have a tough start), Eriksen, Sane, Otamendi and a few others. – I think I’m missing a Man City defender. I’d have enough money in the bank to upgrade Tarkowski to Otamendi after Burnley’s extra fixtures (if I wanted to). – This was put together in under 15 minutes so it certainly won’t be my final team. Doesn’t look too bad a team, DTT. I assume your Burnley picks are because of extra fixtures ? ( Are you falling into that trap again ?? ) Long term, or even short term, i wouldn’t go with Burnley defenders, even though as a team they did well last season. I’m not sure about Bailley. Is he guaranteed to start ?? Keita, is either going to be a revelation, or not get into the team, immediately ?? I’d be happy with Pope for the season. But I’ve got enough in the bank to change Tarkowski to any Man City defender (which I plan to do). I’m not sure about Bailly either but I think Man Utd play first so I can just pick whoever I fancy when I see their line up. Keita is a bit of a risk but at 3m – I can’t see a better option. Would you be happy with Pope if he wasn’t playing in the Europa and other cups? I’d be fairly happy with Pope even if it was just for the league. He scored well last season without European football – relative to his cost anyway. If I knew who was Arsenal’s first choice keeper, I could be tempted by Leno at 3m but I’ve got no real idea about that one. What’s your thoughts on Pope? With Bailly, he’s more of a placeholder – his place should really say “any Man Utd defender once I’ve seen the line ups”. If it is to be Valencia, Smalling, Bailly and Shaw, out of Shaw and Bailly I was hoping he would be the one who holds down a more regular place in the team with Smalling and Valencia being more expensive. It’s a good point about Sanchez, I hadn’t considered Spurs were away so much at the start of the season and with so many players missing a clean sheet is not certain either. It’s a good point – what about Leno at Arsenal. Do you see him being their number one? I think Alisson has been added at 4m so that’s put me off him a little bit. It’s an interesting point about Arsenal as well, I do like the look of Aubameyang at 5.5m and considering how he ended last season. I was put off a little bit by opening fixtures but I think I made the mistake of trying to work the fixtures a bit too much last season. Avoiding games where the big teams met and ultimately some of these ended up being big point scoring games. It did the same for me with regards to Robertson. It’s Leno or Pope for me. DTT, Just noticed your starter team, like the pope or Heaton selection, hope fully find out who is going to be number 1, heard Allison going to be 3.5. Robertson, maybe pay a little more for Van dijk. Bailly, proved last season how brittle he is, if Mourinho true to his word, Shaw or Smalling better options, Jones, to many injuries. Tarkowski, can he emulate last season, has to be a place for Mendy. Mahrez, shorterm can see that working. Keita, surely worth a punt, highly rated, but Mane needs to be considered. Hazard, not sure if he will be their, if not Sane. Sanchez, poor last season but is proven quality. Aguerro, a must have for several seasons now, but that is questionable now, maybe go big on Liverpool with Firmino. Aubamayang, September onwards, others to consider after rest issues, De-bruyne Kane, Tripper. Pogba, Erickson, a lot of planning to do, outsiders worth a punt Neves, Zaha, Sessignon. Shaw could definitely be a good option. I believe they play first so get the opportunity to look at their line up before submitting the final team. Mendy could be affordable for Tarkowski after the extra games. Not sure about Aguero either myself but one Man City attacking player didn’t seem enough. With Burnley having Europe this year I’m not sure they will score like last year. Fab at 2.5 may be interesting as the keeper for a much improved West ham squad. I think west ham are by far the most improved this season. With prices only moving 0.1 per week do you feel you need 2.5 in the bank? If Hazard is off, who would your replacement be? Eriksen maybe or Mane. If it was Mane, I’d probably look at Keita again though. It’s so difficult to know who will be rested! I’ve also read that because of this Asian tournament, there’s a chance that Kane could be in from the off because Son won’t be about! Yeah it’s annoying, it’s a shame all the games don’t kick off at the same time for the first game of the season. Could have had a look at starting line ups then. This season has got to be one of the more difficult ones for knowing a teams regular 11. DTT what about the 3-4-3 formation? I think we might be missing a trick with Chris wood for Burnley? Also please could I join a mini league again if you are doing one? I worked out some figures around the three different formations. I basically took an average for each position and it worked out that whichever formation you choose, it makes little difference. Having 4 at the back means you can score more points as a collective unit with players who cost less. I’d looked at Chris Wood but didn’t want to go too heavy on Burnley players. He wouldn’t be a player I’d look at for the course of the season. You can certainly join the mini league when I set it up. I’ll send over the PIN as soon as I do so. Problems refreshing, just checking for latest comments. What problems are you having refreshing? There aren’t many comments on this post yet to look out for. I think Mendy may be worth a shout as a man city option. The only thing that put me off was his price. 4m for a player who hardly played last season and wasn’t even picked for France? Had he been 3m he would have been the first player I put in. I thought 4m was overpriced. I mentioned this in another post but realised later it was too far up the chain. With prices only moving 0.1 I don’t think 2.5 in the bank is needed and a little more can be spent. I also think west hams fab may well be the better option as 2.5m keeper in a much improved side. Still deciding on my 11 so not sure who will make it. It’s a tough one, I’d left a bit in the bank for Kane and a better defender. Possibly Otamendi, once Burnley have played their extra fixtures. Heaton could be a great option if he’s going to play in Prem and Europe. Yeah but should be fairly easy to solve. We’ve got plenty of time. Burnley potentially have 2 first team keepers out injured 🤕 , time to look elsewhere for a keeper me thinks. If Heaton is fit for the start of the season and Pope isn’t, Heaton could be a good option at 2m. Otherwise I’ll be waiting to see what happens at Chelsea or going for Leno. Just made a contribution. I found your site just before the World Cup and I think your doing a great job and your insight is very helpful ! Keep up the good work I’m sure we all appreciate it. Hi Craig, thank you – really appreciate the support and contribution. Hi Tom, thanks – gratefully received. Did you use the button at the top of this page? Just interested to know if you got redirected back to the blog after PayPal which showed you the password? Hoping it’s working and I think you were one of the first to use it. Just contributed got the password. What happens now. Can we still see all the posts on Facebook. Anyhoo really enjoying all the different ideas for first team, your time and effort is very much appreciated, can’t wait to see what you come up with. Thank you – greatly appreciated. Everything on Facebook will stay the same but you’ll just need the password to get into this post to see the final team I start with. I’ve not put the password on it yet but I’ll put it on before my next update. Looks good, have you left anything in the bank for Kane? Darren, I like the look of ur possible starter team, I guess if Courtois goes, cld have a dominoe effect, D. sanchez, will spurs be weakened if Alderweirald?, & Vertonghen r not back in team soon, putting a doubt on possible clean sheets, maybe just go for Aubamayang from the off, Aguerro who knows, like the Zaha pick, Pedro, keep an eye on that option. There’s certainly plenty of options this time around – disappointing to see Mahrez picked up an injury last night. Hi have been reading some posts on other site’s some people seem to think that there are 3 transfers available for August after the league starts don’t think this is true! Surely next transfers will start from first Friday in September! Also in the recent friendly v Utd mane took the penalty, (salah was on the pitch) could that be due to it being a friendly or will mane take from now on or will they be rotating them or will salah take them again? Mahrez got injured v Bayern don’t know extent of injury yet! Bernardo silva came on got 2 goals! He seems to be liked by who scored.com and gets he’s fair share of goals for city could be a good option! Until the likes of KDB Stirling start playing, I presume most people will put in sane! We will get 3 transfers in August which is always handy, I always see them as spare transfers because unless something goes drastically wrong they aren’t usually needed. I can’t currently accommodate Mane so it would be disappointing if he is on penalties and it was also pretty annoying to see Mahrez pick up an injury. Will need to keep an eye on both of them through pre season. They are money transfers. Drop who didn’t score and pick up who did and once the month changes you could have made 0.9m extra. Don’t think the price rises will affect people as much as last year unless your really unlucky. They only go up 0.1m instead of 0.3m. Also I think there are 2 toms now contributing. Good stuff, at least it worked then (kind of). Hi is the site now password protected? I have contributed to you already as I appreciate the job you do and look forward to your take on the upcoming season. Not password protected yet, it will be this post that is protected and any subsequent ones related to my team – transfer decisions and so on. I’ll be putting this in place over the next few days. I just paid up for the password, when will u next be updating and when will I need to type that password in ? You’ll see the prompt for the password when you need it. I’ll probably protect the post on my next update – early next week I’d imagine. Great site and keep up the good work .Donated today did not direct back to site , how do i get the password . Hi Roy, thanks for the donation, I’ve just sent over the password for you. DTT, received password thanx, look 4ward to next team draft, with inevitable talking pts to discuss & resolve. What’s all the talk of passwords? Is this blog going to be password protected soon? The short answer is parts of it will be password protected. The long answer is, the websites been going for 2 years. There’s a donation button on every post but very few have donated – less than 10 over 2 years. I can see stats around the site, and noticed 27,000 people used it during the World Cup but again very few offered a contribution. I posted this https://www.dreamteamtips.co.uk/important-read-continuing-the-blog/ and quite a few of the regular followers of the blog contributed and were in favour of posts being password protected for a small fee. As a result I plan to password protect the posts around my initial team selection and transfers I plan to make. Only people who make a contribution (can be as little as £1) will get the password to see the team and follow it through the season. Ah, thanks for clarifying. Totally respect and understand. Absolutely – I’ll be circulating as soon as I set any password protected posts. Just contributed DTT. Great insite and you’ll hopefully help me scoop the prize in the mini league I have with my mates. Just have a feeling I might regret not going with Lacazette rather than Aubameyang? Good price at £4m and will play as the central striker. Thoughts? Also toying with having Heaton instead of Foster but not sure if he’ll be starting? Anyone heard anything? Gratefully received – thank you. I’m considering Lacazette as well but can’t help but think Aubameyang will be the main man. I think he’s third favourite for being the top goalscorer in the league so the bookies favour him to score more than Lacazette. I think Heaton might still be injured however I’m looking at him as well. I’ll probably decide on him closer to the start of the season though. I followed you all the way through the world cup and managed to finish 3rd with no knowledge and donated you beer money during the world cup to say thanks for your help. Thank you – the contribution was gratefully received. Glad the blog helped you with the World Cup game. Hoping the Premier League season will be a success as well. This is now very close to my team the only difference is I dropped otamendy for a 4m mid as I think they will score more than a defender over the season and the rotation risk with city mids, saying that I do like mendy. As an enabler I’m looking at someone like Pedro if willan goes or richarlson/jota as I think anyone but the top three at pool may be the pass before the assist. 3 itb for Kane and upgrade else where depending on how things go. Not sure Kane plays game week one as son will still be available. Yeah I was thinking Otamendi is a bit too expensive for my liking but I’ve tried to move away from the mindsight of going cheap at the back as this cost me last season. I’m also trying to avoid any players who aren’t in Europe but who will get a regular game at their clubs. I’m not sure about Everton or West Ham players because either team could have a great season or equally have a really bad one. It’s then difficult to get in a quality player ahead of the cheaper options. I guess the question is, how important is it to have Mane? Yeah it’s Mane that I worry about. Why aren’t you keen on Sane? Thought he’s been steadily getting better and better for me. I certainly want to but at who’s expense? For me it’s the biggest problem I’ve got at the moment. Keita is a big risk for me, even if he does play well how many points will he realistically accumulate? I doubt he’ll get many star man awards, and he’s not known for goals. I want all my midfielders to be goal scorers ? I tend to agree with you. I can’t see it being my final team as I think it’s a problem that might need solving. At the moment I can’t see an obvious solution though. Any ideas where you might cut back to create these additional funds? I like Man Utd’s first 7 fixtures and Sanchez has been on for pre-season. I do have half an eye on Lacazette, then Tarkowski could go back in. Yeah I think that could work. Would it leave enough in the bank to upgrade Shaw when Young comes in? Also keeping an eye on Lukaku. They are cheap but not sure they will get much game time. Danilo is currently injured as well. That is certainly a good option but what if Lukaku starts banging them in? Go down to 4m for that final striker place and it’s a long way to go up to 6m. Mane is key for me and he’ll be going in to my midfield of four. Maddison of Leicester is a cheap midfielder who should offer a good points to £m ratio. I also fancy Aguero up top, especially as I see Kane being rested for the first 1-2 games. Yeah I’m thinking Mane is the big miss for me at the moment. I’m not sure about looking outside of the top 6 for player though. They don’t tend to score as well. I like Robertson and Shaw at the back but not sure about Luiz. They’ve got a lot of options at centre back and will he play week in week out? Yeah I’ve found the defenders a lot cheaper this season – Robertson and Young for example could be great options at 3m. We didn’t get much for that last season. I’ve also read a few times that Otamendi could be rested in place of Laporte for the first game or two. This is of course speculation, but worth keeping an eye on. I think he might be, they do seem to rotate a lot. It’s a tough decision on who to go for with City in terms of defensive coverage. They haven’t got a 3m regular like Liverpool and Man Utd should have in Robertson and Shaw/Young. I can’t see him starting many once the season kicks off, plus he is very injury prone. Highest scoring defender last season… can’t be that shite?…and Tripps will not be starting the season. I’m with Lee on this one. I don’t overly rate him myself but he was the highest scoring defender last season with almost 100 points more than Trippier. I can’t see Trippier starting the first game of the season either. Will he keep his place for the duration of the season though? They’ve got a lot of options at the back. Burnley only get one extra game right? I thought the other one was before the season kicks off, so will not count? Sorry you are right. Just one game but at home. Do they have to play in the playoff round? If so, they may have 3 extra games but I’m not sure. Do you know if they have to play in the playoff round? Because they could end up having 3 extra games if they do. 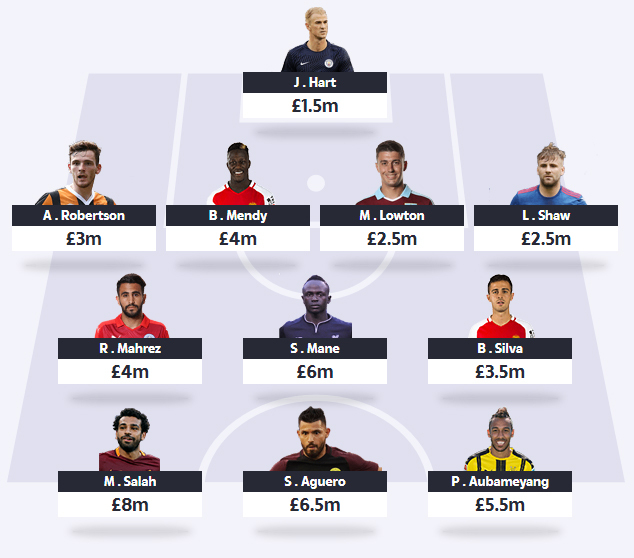 Hi, I play a game based on the Sun Dream team but without the weekly transfers. I have one emergency transfer and transfer window in October instead. What team would you pick based on those limitations? I’d probably go with a similar team to what I’m starting with. I think it’s got a nice balance across various clubs. I’d probably ensure Mane is in though and I’d probably not go for Shaw. I could downgrade Auba to Lacazette to enable another Euro spot. Difficult when the next change I can do is Oct.
Looks a very good starting point to me. 2M itb biggest problem for me is having two city midfielders who will most likely be rotated should still score good. Think Sane will be raring to go. Hoping Lacazette will be played through the middle like pre season got 2m also incase I need to upgrade to Lukaku/Sanchez thoughts? Looks good if Heaton is available. I like that you’ve managed to get Mane in. I’ve seen a lot of people going for Maddison but I’m not so sure myself but we’ve all got to save budget somewhere. Not for me, I’d rather leave out Salah. I can see Kane scoring more than Salah this season. That could be a good move. I had him in originally but wanted to see how Spurs started the season. If he looks a regular, 3m is a bargain. Under sarri I think hazard is a must have. I’m hoping he leaves to be honest – problem solved then. He’s another player I’m struggling to make room for but I’d worry every time he plays if I don’t have him. DTT I’m with the general consensus mane is very dangerous to leave out, also are we now saying Kane will start now I thought we were thinking he would be rested initially? I think Kane will be close to starting the first game. Regardless, he should be playing for the second game week anyway so it would be a waste of a transfer to have to bring him straight in. Obviously the flip side is that whoever we leave out could get a hat trick in game week 1 but there’s nothing to say Kane couldn’t either. Kane normally has a slow start to the season and he looked like he was injured during the world cup to me as he didn’t run much at all. I’m thinking aguerro while he is nailed on and grab Kane once he has settled. Yeah I’m still debating starting with Aguero but keeping money in the bank for Kane. I was thinking along the same lines – I hadn’t looked in as much detail but it’s useful to know. 3m seems like a bargain. What’s your thoughts on Mane, would you try and get them both in? Tough one, personal preference really. Depends on how many other Liverpool players you have and how many your happy to have, not very helpful I know! What position did he play to score those goals and do you see him getting those in a mid behind the pool attacking trio. Burnley look average tonight, it’s no wonder they’ve put bids in for players left right and centre today. Yeah I’m not keen on leaving Mane out at all. Looks like a good team. Ive currently got sane in my team but am quite concerned how little he’s been involved pre season. Pep has said he’s didn’t feature in their last friendly because his fitness needed improving….isnt that what pre season games are for?? Odd. Pep was also critical of his work rate in the one game he has played against liverpool (where he scored). Thought he’d be as nailed as anyone at city to start the season but not so sure now. Hopefully the charity shield will give us a clue. Biggest problem i had last season was trying to second guess pep. I’d noticed the same thing. My concern if I swap Sane for Mane is only having one attacking Man City player. Its going to be a tough call. Anyone thinking arnautovic at 4 mil? I’m debating it but West Ham can be very hit or miss. Looks a very strong balanced team. DTT what do you think? Looks strong, got 0.5m in the bank if you need to upgrade. Didnt Pochetinno say Kane wont be starting the first few game or two? His history of slow starts in the prem are a worry for me..
I’m not sure they will let him start the first game but I’d expect him back fairly soon. I will do. I’ll set it up early next week and circulate the code. I’m considering going for Aguero instead just to start with. Dtt what are u thinking about the Burnley goalkeeper situation? And if u were still gonna double up at the back would u use another Burnley defender alongside tarkowski? It’s looking a bit uncertain. Can’t say I’d want Hart if he does go. Might be better off with a 3m keeper from a better team. Wouldn’t bother doubling up if I don’t get one of their keepers. Both are good options but I don’t think it’s possible to accommodate Kane, Salah, Aguero and Mane with a strong defence as well. Strong team. I’m assuming you’d reconsider the goalkeeping position if they sign Hart? Debating the keeper irrespective of Hart to be honest. Thinking Fabianski or Leno. Also thinking Jota over Keita for game consistency and funds…. Do you think Leno will be first choice? I’m starting to think going with a Burnley keeper is a bad idea, because at some point Pope will be back and will enforce a transfer that could be needed elsewhere. I’m swaying towards picking a keeper who’s a certainty to start. I’d agree with you there. If he does sign I’ll probably look elsewhere. I’m not sure Heaton is seriously injured. Could see him being back for the start of the season. If Hart does go it will depend on his price but can’t say I’d be keen on him so might look elsewhere for a keeper. Are we sure doubling up on Burnley backline will prove fruitful, never heard of their europa league opposition, & the early league fixtures are kind, but can they emulate last seasons clean sheet tally, heard that Christenson & Mendy could play on Sunday, if starting with Salah & Kane, leaves the dilemma one from three, Aubamayang, Sanchez, Lacazette, General feeling looks like finding a way of getting Mane in the team as well, further down the line debates on Hazard & De bruyne will arise. I’m not overly bothered about having much Burnley representation. They didn’t do overly well against Aberdeen. Completely agree about having selection problems in attacking positions, there’s no way of possibly getting them all in. When u planning ur next update mate ? Early next week. I’m away for the weekend and it makes sense to review after the charity shield. DTT I’m with you on not going heavy on Burnley they just got through againsed Aberdeen….. Celtic and maybe rangers aside Scottish football and the premier league is a massive gulf in quality, other premier league sides would of wiped the floor over 2 legs againsed Aberdeen with a second string team, added to that Burnley are trying to sign every man and his dog for a reason. Yeah very poor. I might just get one defensive option for August. I am not sure about the Hart to Burnley move. As someone said earlier, you want to pick a keeper and not worry about it. With 3 keepers, who in my opinion are pretty much all on a par, it is going to be very difficult to work out which one will be Number 1! Plus the extra European games are useless, as the keeper is bound to be switched for Cup games, domestically as well. With the injuries, they will probably keep all 3! I think most people are expecting Courtois to leave, which will mean some last minute merry-go-round for the likes of Butland, Schmeichel, Pickford, and potentially, I thought, Pope or Heaton – but that looks unlikely now as Stoke, Leicester and Everton would want someone in who could play straight away! Problem solved if Pickford went to Chelsea – that would be a no brainer for me at 3m. Running out of time though. This is a well balanced team with only the keeper being a possible week buy but considering the low ceiling on keepers I think it’s not bad. I’m not too fussed about the keeper. It looks like a strong team to me. Highly likely, desperate to get Mane in so may need to rearrange quite a few players. Hey looking forward to the new season. What do you think of my team? Cheers and good luck for the season! Decent team, not sure about Shaqiri because of game time. Sturridge is a red herring. He has had good pre-seasons before… and been heavily utilised… until the season starts! For me, not sure he will get enough game time. I still dont think Willian is back in training at Chelsea and has already fallen out with Sarri. He is pushing for his move to Barca. It wouldn’t surprise me if the situation becomes untenable at the transfer happens after the Premier League Transfer window closes. I would stay away from him at the moment. Pedro will be starting for Chelsea – I would select him for the start of the season and see how the situation pans out at Chelsea, if you are looking for Chelsea representation – save some coffers in the bank! I am hearing that Christensen is nailed on starter for Chelsea this year. At £2.5m he could be the bargain of the season! He’s one that really appealed to me but I notice he didn’t start yesterday. What makes you think he’s going to start? Sane is of concern as he has played very few minutes in pre season friendlies. Sometimes having too much time off on holidays can have a bad effect – fitness can go out of the window and there have been instances in the past where players come back overweight or as Mourinho said about Valencia ‘having too much holiday’ this summer and may be the reason for picking up an injury. Sane is a player that Pep tends to be quite strict on (maybe because he is young and/or can perform much better with his ability). Last summer Pep was not happy with Sane’s pre season and saying he was behind the rest of the group and didn’t deserve to play. Indeed, it took a second half appearance against Liverpool for Sane to have an impact but that was only in September. So he didn’t get off to a fast start. It will be interesting to see how Sane does in the community shield. Maybe Sane is raring to go but Pep is holding him back for the upcoming league games. Regarding Keita, he sounds like a risky pick to me. I don’t much know about him plus I don’t read too much about how did in Germany although I do find his disciplinary record quite interesting with 3 red cards to his name last season. I think I will go without. One of my rules is that I need to watch a player for 90 minutes to make a judgement (unless I read something amazing like this new player is the new Mo Salah or Kane) . I’m not really a stats person although I am aware that people can do well with just stats themselves without the need to watch a single minute of football. So I think I will watch Keita play a few games and then decide. Plus with transfer prices not spiralling out of control this season, I should be able to easily afford at a later date. Thanks – useful analysis. I noticed Sane went off yesterday as well. Might have been an injury. What’s your thoughts on how essential Mane is? And it looks like we are all going to have to go for a cheaper player somewhere in the team to accommodate these big names, have you got a particular cheap player that you’ve gone for? Mane – with him taking penalties in pre season makes him essential especially as Liverpool generally get a lot of penalties. I don’t agree that you need necessarily a cheap player to accommodate these players, you just need to spread the funds evenly through the team. I made up a minute and the cheapest player is 3.0m. The cheaper you go the harder it is to replace. Harder if they go down. That’s why players worth 1-0-2.0m don’t interest me much as they can be laying in your team for months as you got no funds to replace them. DTT, so much useful information and feedback on this site. The returning players and Manchester United playing Friday makes it harder to have a confirmed squad. Add that to some injuries in pre-season to goalkeepers and seems like I’m changing the team on a daily basis. I am looking to start with this team and have options to make changes in August. Any opinions welcome and good luck all to the upcoming season. – Everton have a nice start to the season but look to swap to Leno at some point. – Money in the bank to swap Aguero for Kane if Pep continues to swap forwards. – Downgrade Ottamendi to a 3 million defender and have 2.5 million to swap Aubameyang to Kane if necessary. Looks decent to me. After yesterday I’m considering starting with Aguero now as well. My only concern with your side would be Pedro and Richarlison – I personally wouldn’t want either of them and they could be hard to replace. Not far from what I’ll start with I don’t think. Assuming you’ve got some in the bank for Kane? Not sure about Pedro personally either. I honestly think Morata is by far the most underpriced player in the game this year. He looks a good price but his form needs to change quickly. Yeah I noticed that. At 3m it’s certainly tempting. What are we to gleen if anything from the charity shield line-ups, Lacazette selection seems to be gaining momentum. I was surprised to see Stones and Walker start and no Otamendi. Aguero looks sharp, could be essential to start with him now. Luiz is a good price if he’s a regular. I think yesterday’s performance suggests we should probably start with Aguero. Thoughts on my team please.. MID: Mahrez, Willian, Mane, Jota. This will change before the start of the season I’m sure. Not sure about the Burnley GK situation. Happy with Man Utd, Man City & Liverpool defensive coverage, although I have 0 in the bank which would make it more awkward to upgrade Shaw if necessary. I am also unsure if it’s wise to double up on Man City and Liverpool attacking coverage at the expense of covering Arsenal or Man Utd. For Man Utd I would want either Sanchez or Lukaku and Arsenal Aubameyang or Lacazette but would happily leave my front 3 as it is. Is my front 3 too heavily weighted and Jota too much of a gamble? Is leaving nothing in the bank also too much of a gamble? Thanks in advance. Facing exactly the same problems that I am. Ultimately you’ll have to risk it on someone like Jota if you want to accommodate the big names but having 0 in the bank is a worry. I wouldn’t be too bothered about doubling up on Liverpool and Man Utd players. I can’t say I fancy Lindelof, personally going to risk it with Shaw. Yeah I’m not sure he will hold down a regular place though. Sane came of with an injury and didn’t look too good as it was. Mahrez lots of space played well but wasteful. Meanwhile b silva was straight fire and pep is saying is ahead of the pack to be picked, can’t trust pep but it’s worth mentioning. Mendy looks a great buy if he can be squeezed in. Aguerro on form and he is deadly when on. I might go for Aguero to start now. Also Mendy might be a better option than Otamendi. Looks a decent side – I’m not keen on Richarlison or Jota personally but appreciate that funds need to be saved to get all the big guns in. DTT – what is your latest team? DTT, just out of interest what makes you opt for a 4,3,3 formation rather than a 3,4,3? Is this likely to change before the start of the season or just the team selection? Just how my team naturally came together. I can’t say I favour any formation really. Yeah I may well do this before Friday. Although I’ll be taking him out at some point as I can’t see them having that good a season. I’m unsure on Tripper, a lot of people think he won’t play much of the 1st few games. So many choices. Put a couple of Wolves players in as can see them hitting the ground running for 1st month. I can’t see Trippier playing, I also can’t see KDB or Hazard playing the first week either. Have you left enough in the bank for Kane? Tbh I can’t see Burnley qualifying for the Europa league! Istanbul (adebayour, clichy, Turan etc, if they do make it then the Greek giants Olympiakos! I’m not banking on them doing much either but I don’t think having one of their players is a bad shout just for August. Any-one considering Pedro, may need to think again, think Willian is staying put, only 4 million, bit of a lazy player but scores consistently, nobody mentioned B. silva only 3.5,,cld get more gametime than Sane, when is next update DTT. I don’t think I was considering Pedro, think his best years are behind him and even without Willian I think he would substituted a lot. Sometimes got to take pre season form with a pinch of salt. B.Silva good player but once D.Silva and De Bruyne are back, he will go down the pecking order. Might be a good short term for August. DTT, here’s what I’ve come up with. Shortcomings, no funds for possible Shaw upgrade, B. silva, Pep indicated he cld start with him, trying to predict Man city defence difficult, Mendy preferable, go straight to Eddison.Lacazette hopefully playing down the middle & on pens. What do you think. I like Lacazette as an option although they do have a tricky start. I personally wouldn’t spend 4m on a keeper though. The rest of the team looks very solid. 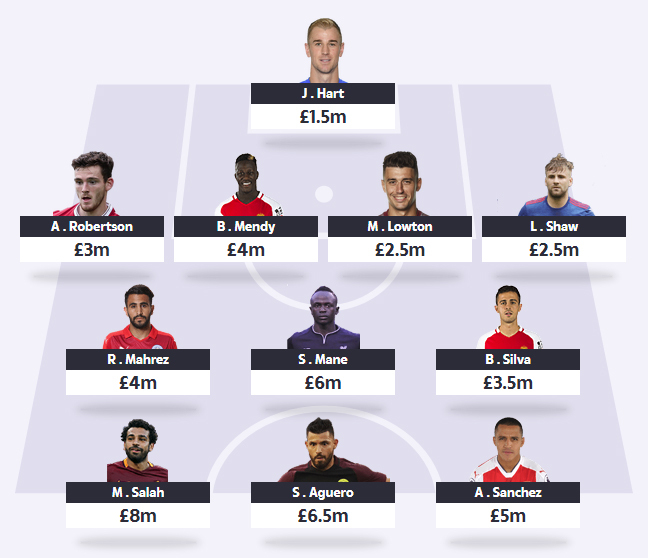 Would anyone accomadate Firmino and Mane instead of Salah? Also like the look of Mustafi for 3m after the hard start, Good stats on WhoScored. Looks a fairly solid base to start from. I’m not sure about Chelsea this season though. Morata would have to quickly start scoring, he wasn’t great last season. My main concern would be not having the funds to get Aguero in after the two goals at the weekend with taking out Kane or Salah. Just checking for latest post’s. I’ll be updating later today. I’m looking at B. Silva as middle ground between Keita and Sane. Could be a great option. Just to throw another spanner in the works, if Sanchez plays up top against Leicester, he’s only 5 million, not seen the best of him in a utd shirt yet, but proven quality, & a decent pre-season under his belt, with good fixtures to come. Yeah I had him in originally but took him out. Still considering him for the start of the season. DTT joe hart is in at only 1.5M do you think this is an option? I’m not overly keen but at that price it’s hard to resist. I’ve just put him in my draft team. Included him in my revised team to free up some funds. any new team selections DTT ? Just posted a revised team. You may need to refresh. DTT – I like your team purely for the flexibility at this stage of the season. B Silva is a brave choice, have you considered Sigurdsson of Everton, they have some great fixtures? I might go for Willian over Mahrez or B. Silva. Hadn’t really considered Sigurdsson, he didn’t score overly well last season did he? He was restricted under Allardyce and many feel the shackles will be off this season under Silva. Willian is a good option though. Yeah he could have a decent season but I’m not convinced by Everton. He’s one to wait and see on for me. Like the team but I worry about Aubameyang as I think he will be played on the wing. Yeah I’m considering just going with Kane. Based on Arsenal’s fixtures Aubameyang could come out and Kane could still go in without having to move anyone around. There’s 3m in the bank still. DTT, thoughts on latest draft, I think Hart & Lowton a bit risky, they have been patchy at best in pre-season, latest acquisition B. Gibson who does he replace, but as you say we’ll see what the ripple effect will be if any regarding Courtois, according to physioroom Mendy injured not fit for week-end, may have to look at Laporte, Willian for chelsea cover may be option, but lacking in fitness may not start, flexibility with 3 million spare, have to go in strong though, Aubamayang high ownership, but Lacazette more than matched him in pre-season, cld be missing a trick their, looks like no place in team for arnautovic, West ham cld be surprise team of season, much to resolve, see what first leg score is with Burnley on Thursday nite. Interesting thoughts as always, I can’t say I’m 100% happy with it but I struggle to see many better options for the keeper position at 2m or less. Take your point about Aubamayang but Kane is an option anyway or even Sanchez. What team would you start with? I really want hart in my team for that price but not sure the situation with heaton at the moment. Seems like pope is out long term but anyone know how long heaton is out for? I’m not sure but I went on the basis of Hart wouldn’t have gone to Burnley willing to sit on the bench. Surely he’s been promised some kind of first team football otherwise he would have gone somewhere else? Yeah thats a good point, I think right now with heaton having a calf problem hart is looking good for the first 2- 4 weeks of the season then it might becomes a fight between him and heaton, If he does lose that fight then hart can be transferred out later on. 1.5 is hard to overlook with the extra fixtures and a nice start in the league for burnley. That’s what I was thinking but it’s not an easy choice. Was tempted by a premium keeper but I’m not seeing any real cheap options for a defender. Would you start with Kane from the off? Bournemouth have signed a new left back for £10M (RICO) so I don’t think Daniels will be a regular. Decent team, I’ve played with the idea of having a premium keeper but couldn’t justify it in the end. My main concern would be Daniels. Very strong team. I think you will have to go with Hart because you won’t get chance to see the line ups at the weekend. As soon as Man Utd and Leicester play on Friday no transfers can be made unless they come out of your August budget. Very similar team to my own, the only difference being I’ve swapped Mendy for Willian. Still leaves £3m in the bank. Toss up between Auba and Sanchez for me. Arsenal have a tricky start against City and Chelsea, so more tempted by Sanchez at the moment. Firminho also a potential shout. Yeah I’m tempted by Sanchez or just to go with Kane from the off. Can you see him starting? Couldn’t resist leaving Kane out and I finally succumbed, he’s got to score in August sooner or later right? Decent starting fixtures too. Hoping Hart can feel wanted at his new club and find some form behind a decent defence. Gone for Lowton (FB) now as Mee and Tarkowski will be looking over their shoulder at Gibson for the CB berths. Stones £0.5m cheaper than Mendy and I reckon he’ll be the first choice CB for City this season. As seem in the World Cup, could be a threat from set pieces too. Hoping for a better season for Sigurdsson this season as I really like him and could make things tick for the toffees. A threat from dead ball situations too. Giving Sessegnon a go to see how he settles to the Premier League. If he takes to it, could be a source of a few goals and star mans. Leaves £1m in the bank for future upgrades. Thanks for your time Gents. It’s a tough choice for a City defender. I’m also drawn to Stones for the 0.5m saving but I think he’s a selection risk. Interesting that you’ve gone for Kane to start as well. Do you fancy him to get off to a flyer? I’m not sure about Sigurdsson, Arnie and Sessegnon personally – I try my best not to look outside of the top 6 teams but this may be a little narrow minded of me. Nice team Roman. Think I may be looking for a cheaper keeper and upgrading on Daniels though if I’m honest. Also is Keïta a risk? He was in my original draft and I can’t seem to get away from him. Strong team Dan. Will Mahrez start week in week out though? I had him in my original draft too having said that. Great player at £4m if he does start regularly though. Thanks. At 4 mill for a city attacker I will take the gamble. I also think he will definately start the first 3 and if he does wel who knows. Re your team, it’s a different mid than most I have seen. Sess could be a huge differential for you but personally I’m not sure what returns you will get from him from a newly promoted side. Onto Sig, on all set pieces I expect and could be good. Do you know how he’s done in pre season? I’d looked at him before but I struggle to get away from the more proven point scorers like Willian, B. Silva, Mahrez who are a little more expensive but less risky. Shaqiri and sturridge both looking strong for Liverpool here. Anyone willing on taking a gamble? Definitely not with Sturridge, he’ll be injured again soon enough. Shaqiri is a possibility but there are better attacking Liverpool players to pick. Neither for me, can’t see them getting enough game time. Otamendi, after not being picked for the community shield and the defence looking tidy, will pep want to switch it back to otamendi? Courtois trying to force a move, speculation of willy caballero starting? Could be worth a punt? Lowton and robertson seem like two good full backs so im happy to keep them My concerns are just CB’s, currently otamendi and baily. Is baily injured? I can’t decide between Otamendi, Mendy or Stones. I like Stones because he’s cheaper but I think he’s a risk for game time. I’m currently drawn to Mendy. I think Chelsea will sign a keeper so can’t see Caballero starting. Heaton might not start with a small injury and Hart recently joining – he’s only 1.5m as well. I think Bailly is injured but Shaw is a decent option at 2.5m? Otamendi, lots of talk about how he wasnt picked for community shield and the defence looked good without him, best to leave him out for now as hes expensive? Bailly, is he injured? I know you have picked shaw… but is there a better Man.U replacement? I think my fullbacks are covered with lowton from Burnley and robertson from liverpool, im just wanting two solid centre backs to score points. I also orignally picked Heaton in goal but seeing as Hart has just travelled over to Burnley, im looking to copy you and put in Hart. Seems like he should start and he starts to have a disaster then he will be moved out the starting 11. Just seen you’ve updated since your last post. Shaw can be replaced by Young if he comes back in – both good cheap options. Are you not starting with Salah? I can’t see Lukaku playing in the first game. People are missing the point with Mahrez. He wont start every game, but none of those City players will play every game (Mahrez, Sane, Sterling, B. Silva). I am confident that Mahrez will feature in most games though, either from the start, or as a 2nd half substitute (20-30 mins). Man City have a lot of games this season and will be wanting to keep players fit for all competitions, so there will be rotation. Completely agree with every point made there. At 4m it’s hard to overlook Mahrez. Nice team stream, gone a slightly different route myself. I have effectively dropped Shaw and replaced him with a pricey midfielder. This allows me to drop him for Kane when needed and grab whoever is looking good between Shaw/young/richarlson/siggy/ Jota and so on. It will cost me a transfer but will have a stronger start and the ability to pick my budget option once I have seen them perform. I’d personally rather leave Kane out but what worries me is getting off to a bad start. You can see he’s been selected by loads of people – should he start and grab a couple of goals then we are instantly on the back foot. Unless the man you’ve picked also bangs a couple of goals in or more!! Solid team but I’m not sure about Sessegnon or Jorginho. Think Jorginho is defensive but I’m not 100% sure. Nothings changed yet. I’m likely to bring in Sanchez in place of Aubameyang but that’s the only change I can see me making before kick off tomorrow. Just been looking at predicted line-ups and they have Sessegnon playing left back?! I know he used to play there but I thought he’d be playing in the attacking 3rd. Any thoughts guys? May have to re-visit that selection if that’s the case. It doesn’t overly concern me – there’s a lot of speculation about a lot of players. If he starts Moreno over Robertson he must be mad. Money left for upgrades, possible new Keeper to Chelsea, risky whatever the price, new league etc, would stay away from selecting Leno/Cech, possible shared gametime, not what’s required. Where is this mendy ‘injury’ news coming from? He played 90 mins on sunday and i cant see anything from pep or man city that suggests he’s a doubt for the weekend. Looks decent but not sure where you’ve seen that Mendy is injured? I’ve not seen that anywhere myself. Some websites think Kane will start this weekend, some don’t. I can see this being a last minute decision before the United game for many of us. I seem to be tweaking my team a fair bit now after looking at the predicted line-ups. The World Cup has created all sorts of problems when it comes to selecting a starting team. I’ll just be glad when the season gets going now. Checking to see if any changes to 2nd draft team. On my third draft now – updated it yesterday. Anyone considered Schürrle at Fulham? Plays as forward/attacking midfielder, still only 27 (seems like he’s been around forever!) and only £2.5m. Worth a punt? I think he could be worth a punt especially looking at Fulhams fixtures. However, I think he didnt join too long ago so no idea how match sharp he will be and as a result if he will start the first game. But he deifnintely has goals in him based on his time at Chelsea! Leaves £1m in the bank. My only observation would be that you’ve got 4 players outside of the top 6 clubs. Historically players from the top clubs score higher but it’s not always the case. Not sure about having Schurrle and Arnautovic. I had a lot of change in my team and finally I’m happy with it. 4 city players, 4 liverpool players, 2 united and hart. I think it is a good balance cos city and liverpool look like the strongest team. What do you think about my team? In a further of course I will looking to swap sanchez for Kane and sane/mahrez for hazard. Looks strong. Not sure Young will start but will you check this before they kick off on Friday and possibly go for Shaw instead? I’m going with the Liverpool attacking trio. Reasons being favourable fixtures, goals and assists and I think Liverpool will be a threat to Man C this season. Is Young going to be starting mate? Thought he was out to begin with hence many choosing Shaw. Not sure Young will start but you can check this before kick off tomorrow. Any money in the bank for Kane? I choose all three because they are so high scoring, with Liverpool is usually a combination of the three. Think they are a great combo myself – Salah gets the goals, the other two get all the assists. Used this tactic to great effect last season. Some games when Liverpool went goal crazy – it was points galore. However, it will be tough to get all three in the team as they cost 20m compared to last year’s 15.5m and Salah has moved to a striker’s position. It also killed the 442 formation which was very successful for me. Now three strikers is the only way to go. I personally wouldn’t but I can see the appeal. They were scoring for fun last season. Young is a maybe, I will change come Fridays team news. Potentially to Shaw. I personally would wait on Auba, Arsenal have a difficult start. I can’t overlook Firmino or Sanchez as 3rd striker. Also is De Bruyne potential starter against Arsenal? What about hazard guys? Is he ready to play? I’ve gone for Mane instead until we see when Hazard is likely to be back. For some reason putting Joe Hart in my team doesn’t feel right. I know he is very cheap and that part of the appeal but I have too many doubts about him. One, is he first choice or will he lose his place? At West Ham, I think he had the lowest save percentage of all keepers in the premier league, he is slow to react and get down to shots (some people have told me particularly on his left side). This summer I made a list of the all players in the game and gave them a racking out of ten and Hart appears towards the bottom (in red, colour coded players into categories yellow for essentials and red to ones to avoid). Two, his price makes him very difficult to replace if needs be. Currently other keepers at same price are Begovic, Cardiff keepers and Lossl so wouldn’t want to do straight to either of them plus if Hart’s price drops then more problems. Keeping money in the bank is a good idea to avoid these problems but the Hart move pay off. I am just in two minds about it and just trying to clear my thoughts. Pope injury has really ruined my plans, figured highly on my list and would have happily paid 2.5m for him. Along with De Gea, top keeper for saves. I’m not happy with Hart either. I wanted Pope myself but when Hart came in at 1.5m I found it hard to resist. Helped free up funds for some more premium players elsewhere. Bit of risk though as he’s not certain to be number one choice. Can we eke out another million for Firmino, as the 3rd striker. I think I could accommodate him but I’d rather just stick with Mane and Salah. 1) are we still able to make changes saturday and sunday before the fixtures Kick Off – exceptions of course being Man Utd & leicester players as they will be locked out for the week providing of course. So eg if I have stones but see laporte starting can I swap without it being considered a transfer? You’ve pretty much answered your own question. If 4-3-3 works for you having won three times then stick to that system. Depends if you think that extra defender will outscore a potential midfielder. Me personally I’m going 3-4-3 there’s a luxury of midfielders to pick. Thanks Marc, It’s the hardest one ever. I am thinking getting the likes of hazard/mane VVD in early as you can downgrade to some tasty cheaper options if need be – its the same as having money in the bank really. What about the other point – point 1, do you know how that works please? What would your full lineup look like in order to accommodate both Hazard and Mane? I’ve tried to figure out a lineup to achieve this myself but find I’m leaving myself a bit weak in Striker positions and end up with virtually nothing left in the bank to switch one or two cheaper options if needed. So tough trying to get the right balance whilst getting in as many big hitting proven point scorers as possible. You can’t make changes on Saturday unless it comes out of your August budget. As far as I know anyway. I terms of formation, I don’t think it matters too much. There’s a case to be made for all of them and I’ve tried to work out statistically which one is better – they all come out roughly the same. Been hearing that Wilfred Zaha has been playing pre season and has got roughly 200+ minutes under his belt and during pre season, he has been played in the striker role? Do we think crystal palace will have him more attacking, reckon this could be a good choice? Chances for more goals, potentially assists as he could hold up play etc. Pretty much bang on the team I’ve ended up with. Still toying with the idea of cashing in on B. Silva, utilising the money banked, and then reversing the decision when it’s time to get Kane in. I still have doubts over Sterling. I know he had an unbelievable season last year but I can’t see him repeating those numbers again in goals and assists. He will also have more competition for a place in the lineup with the addition of Mahrez and B.Silva looking really sharp in the Charity Shield the other day. KDB and Hazard are fantasy powerhouses. Star man rewards for fun, goals, assists, the lot. I had both in my team last year but I’m struggling to accommodate either of them this time round. 6.5M for KDB is brutal. Have to make significant sacrifices elsewhere to bring him in. Hazard could be brought in to my team in place of Mane potentially but I already have attacking coverage for Chelsea in Willian who I think at £2m cheaper is arguably the better option. So many choices! Decent team. Personally I’m not sure about the idea of tripling up on a team in attacking coverage even if it is Liverpool or Man City. Depends if you are considering changing Mane or Firmino after the opening weeks, may be a decent short team plan as I think Liverpool will hit the ground running. Im also reluctant to include players that aren’t involved in European competition although I currently have Jota and Hart who may not be in Europe much longer. Top scoring players are generally players from the top teams involved in European comps but saying that it’s almost impossible to pick a team without one or two gambles in which case you have gone with some decent picks. If Coleman can recapture some of his pre-injury form he could be a solid point scorer and hopefully Fabiaski makes a smooth transition into the Hammers side. Such a hard start to a Fantasy season, so many factors to take into account with World Cup etc..
My first team is identical to yours as it stands. Second team as below. Unsure which to use as my main team at the moment, saying that I’m changing both on a daily basis! Decent idea although not sure if Hazard will be in the starting lineup to begin the season? Also if Sane is potentially dropped after a couple of weeks to upgrade Sanchez to Kane, would that leave you nothing in the bank to make changes to Hart, Shaw or Lowton if needed? I have Jota in my team but not sure if I’d have him in a 4,3,3 rather than a 3,4,3. Your other 5 attacks may make up for that though. Strong team and good coverage of top teams early on. Considering any Arsenal coverage? I have noticed some people are suggesting tripling up on Liverpool or Man City attacking options which I can understand why but think it does carry some risks and has its limitations as it reduces the likelihood of you picking up multiple ‘star man’ awards which add up over the course of the season and I personally wouldn’t want to have too many eggs in one basket. I try to get attacking coverage from all of the top 6 teams, although saying that, as a Man Utd fan I’m finding it difficult to persuade myself to include any Utd players in my attacking coverage. Absolute train wreck of a transfer window, again leaving everything until last minute and will end up panic buying someone like Maguire last minute for £80 million. Look forward to is battling it out for 3rd. I am currently doubled up on City and Liverpool attackers and have no coverage of Arsenal or Man Utd. Will be tempted to get Auba in after the opening couple of weeks but I’m struggling to include any Utd players. Sanchez looks like best option but there are better front 3 options without him. Much better 4m options than Lingard in Midfield. 0.5M in the bank to upgrade Shaw to Young if needed or Hart to Heaton if needed. May downgrade Aguero to Auba after first 2 weeks to free up some funds but don’t feel comfortable about dropping a player like Aguero. I’m considering swapping B. Silva for Willian to readdress the balance. I agree that three City attacking options may be a little over the top, especially considering they start against Arsenal. Do we know if Willian is fully fit to start? He started against Lyon the other night, so I’d say he’s near fit yes. What about Hazard, surely he’ll need to come into the frame at some point? The only way to accommodate Hazard is to take out Mane. It would be virtually impossible to have Salah, Kane, Aguero, Mane and Hazard in one team. If you choose Willian, wouldn’t that prevent you brining in Kane and Young you’ve planned? Yeah it would – Willian would have to come out as well. But we’ve got three transfers for August. Do we think Young is certain to replace Shaw as well? As midfielders tend to do better.. how come few are taking 3-4-3 formation? I like the team, but not having Kane is a risk, but having Shaw/Hart I see as the bigger risks imo. Got plenty in the bank for Kane. I don’t think Shaw is a risk as he can be swapped for Young. Agree that Hart is a risk but needed to save funds somewhere. I don’t think formation matters too much and I struggled to spot any 2.5m-3m midfielders. I’m happy with having the trio of Liverpool players to start with even taking in the account t of starman awards etc. Dont like picking a wolves player in a mid slot that’s a massive gamble. I’ve done a re draft and picked hopefully starters for the early games. I want to hopefully hit the game running early. Fair enough, valid points. I do have reservations about Jota. Im struggling to find an alternative in a similar price range unless I can’t formation and pick a team almost identical to DTT’s. Not sure if feel comfortable having that much coverage of City and Liverpool but could end up paying off. Best of luck! Strong team – have you got a plan for bringing in Kane? DTT, nearly good to go, need to look at Burnley result 2nite, if they have a disastrous 1st leg, will have to have a re-think Hart & Lowton wld be to much Burnley cover, 3.5 million in reserve for inevitable eventualities, would also not want Hart to have a bad start, & his stock start to slip under 1.5 million, as somebody mentioned earlier, lastly as you say check on Man utd line-up for Shaw, & Sanchez, hopefully playing up top & not in a wide position. Annoying that Lowton isn’t playing tonight but I hope he’s just being rested. what about Van Dijk, instead of Mendy? Got a feeling he might score a fair few this season?? With having Robertson, I wanted some City representation at the back. Lowton not starting for Burnley tonight! Do we change to Taylor who is 1m I think ? Think he’s being saved for the weekend? Have a good feeling King could show his stuff against Cardiff and other early fixtures. 5.5m in the bank allows the King>Kane upgrade and also another 0.5m to take into account Shaw being replaced by Young. Any thoughts on my selection? I wouldn’t personally drop down to someone like King but it could easily pay off. I’m not sure about Jota either, a lot of people seem to be going for him but hard to replace if he doesn’t start well. Have a good feeling King could score well against Cardiff and other early fixtures. 5.5m in the bank allows the King>Kane upgrade and also another 0.5m to take into account Shaw being replaced by Young. Any thoughts on my selection? And also would you replace Arnautovic for Willian or Mahrez? According to football scout predicted lineups for week-end, Lowton to play, no Willian in Chelsea team. Just had a look – they’ve got Willian down to play? How accurate do you find it? Can’t say I’ve ever used it before. Yes ur right DTT, Willian is down to play now, he wasn’t earlier, not sure on their prediction percentages, need to do a bit more digging/research 2moro. I’m considering going for Willian rather than B. Silva but I’ll make a final decision tomorrow. Any thoughts on this? I fancy Mahrez to score more over the course of the season which makes it a difficult choice. I would personally prefer Willian. He may cost 0.5m extra but will get more minutes and will also add some diversification to the squad by having some Chelsea attacking coverage. As a Man Utd fan I’ve also noticed that Mourinho has said that Valencia and Dalot are both injured and unavailable for tomorrow nights game. He has also indicated that the players that returned late from the World Cup are not 100% ready yet. This should pretty much guarantee a start for Shaw tomorrow night. Yeah I think Shaw will start tomorrow but will he keep his place? I’m not sure he will so will ultimately need replacing at some point. Will Burnleys 2nd leg count for dream team points? As far as I know because it will be after the game starts. Had he been 3m I may have been tempted but not for 3.5m. What do you guys make of this as a potential lineup once everyone has returned from the World Cup etc.. I know there are some question marks over a couple of the defenders. Still need to see if Sanchez will be a regular at Spurs. Luiz may not be a regular at Chelsea although Sarri seems to indicate that he favours him and Rudiger as the first choice CD partnership. I am happy with Man Utd and Liverpool coverage with Shaw or Young and Robertson. Would have like some Man City coverage in there but have to make these sacrifices in the defensive line to accommodate the front six. I would have liked Hazard instead of Willian ideally but had to compromise somewhere. I think Willian is a pretty solid 4m option and should get plenty of game time. KDB is the best route into Man City attacking coverage if he can be accommodated. He’s one of the only players other than possibly Fernandinho who is almost rotation-proof. Should have another huge point scoring season. Mane should have another huge season with Liverpool. Salah and Kane speak for themselves and I think there is value with Lacazette (after the opening 2 fixtures) as he is expected to lead the line for Arsenal with Auba likely to play on the left of the front 3. With Auba, Mkhi, Ozil and Ramsey creating he could have a great season at just 4m. I also like the fact that I have alternative options in the back line at the 3m price range if either Sanchez or Luiz need to be changed. What are your thoughts? Decent base to start from. I had Sanchez in to start with but with a far from first choice back line I decided against him. I like that you’ve managed to get KDB in, although I’m not sure he will start at the weekend. My other concern would be if Aguero started the season on fire. Would you be able to move things around to get him in quickly? What are people’s thoughts on Pogba? Anyone thinking of bringing him in when he returns to the starting lineup? I think with the addition of Fred and when Matic is back fit, it should give Pogba more freedom to play in a more advanced position. As a Utd fan I think he’s due for a big season but not sure if I’m being overly optimistic? I’m also a Utd fan and not overly optimistic. They’ve not had a great preseason, he’s definitely due a big season but they can’t seem to get the best out of him. He’s one I’m happy to wait and see on. what do you think to Zaha for Mahrez/Silva rather than have 3 city forwards? He has been in great form. Zaha was on my list before I saw player prices, he did well last season. However when he came in at 4.5m this instantly put me off. For that kind of value I’d want a regular from one of the top clubs. hart – VVD, shaw, luiz – B Silva, Mane, willian & keita – aguero, sanchez & salah with £3 mill in bank for kane but worried about not having hazard. Any advice welcome – i know we are all busy with our own teams but grateful for any advice – not keen on cheap defenders like daniels & doubling up on burnley at back and would rather see how new players like jota work out before diving in and my logic is it’s easier to downgrade expensive players than upgrade from jota to hazard as that would require 2 transfers?? Facing exactly the same issues that I’ve had. I don’t want to go cheap at the back or in midfield. Even having Hart at 1.5m annoys me but I’ve just accepted that if we want the big names we have to go cheap somewhere. My concern with both teams would be when you’ve got Kane back in, will you have enough to take Shaw out? I think he will inevitably get replaced by Young after a few games so I’m trying to hold back funds to swap this two over. I’ve accepted that I can’t have both Mane and Hazard in midfield so I’ve saved one space for a 6m midfielder. My plan is to rotate between them or access how important it’s going to be to have Salah after a month or so. So today’s the day it all begins. Looks a strong team if you’ve got a plan in place for getting Kane in. I noticed you’ve got a front 6 split between Liverpool and Man City players, are you not worried that you’re going to heavily rely on these two teams? I’m slightly concerned about having three City attacking players and I’m still pondering if I should go for Willian to balance it up. Pretty much decided to stay as I am for now. Very early days and fairly happy with my team. Also I could take out Kepa for Hart, then that frees up funds for Kane transfer? At the moment no changes. Just waiting to see line ups. Leaves £4m in the bank for the inevitable changes. One question? Do we get three transfers to use during August and then another three at the beginning of September? Many thanks for any comments. Can’t wait now! Yeah should get 3 in August and 3 in September. Gone for a similar team, although I’ve gone for Willian over Arnautovic and currently Mahrez over B. Silva, although I’m tempted to swap these. Three transfers in both August and September. Just waiting for the line ups for the game tonight. Will be glad when it gets going. Recent interview with Pep said team would be B.Silva and ten others for first game. He’ll be playing. Could be a bargain. Do they have no other cover? I have made tons of changes to my team selection over the last few weeks but in the end have decided to go almost identical to you DTT although I have gone with Willian rather than Mahrez mainly to secure some additional ‘top 6’ coverage. I noticed you mentioned you would rather take out B.Silva for Willian than Mahrez. I understand you think Mahrez will be a higher point scorer over the course of the season but is that extra 0.5m from swapping Mahrez out instead more valuable in terms of money in the bank and extra flexibility for transfers? I like Mahrez as an option, he’s always scored well in a worse team. I’m going to stick with both of them and see how they get on early on before making a decision. Final team I’m not messing with it anymore haha..
0 money in bank but I think this weekend Moura will start as spurs are short and b Silva looks good, that front 3 allows me pretty much any replacement if need be and can switch the defenders with any number of options and Moura and Silva can be swapped for jota and Willian. So to clarify DTT, no Chelsea cover, sticking with Mahrez & B. silva, hopefully Shaw plays, if Sanchez moved out wide interesting to see if u still go with him, the three pronged liverpool attack still option, with Firmino down the middle. Yeah I’m sticking with what I’ve got. Nice start with Shaw getting a goal and MOTM award. Shame we didn’t finish it off with a clean sheet and Pogba pinching the penalty off Sanchez but can’t have it all I suppose. Disappointing for me – Pogba took star man. Shaw was catching him until they conceded. Sanchez was on for 3 points until they conceded. As you say Sanchez should have took the penalty. For me should have been around 21 points for that game rather than 8 but that’s just how it goes. I forgot that sky MOTM doesn’t necessarily mean Star Man points which Pogba was given. I also thought that Sanchez would have picked up an assist for the build up to the penalty being last Utd player to touch the ball? Annoying that he was given a 6.8 rating picking up 0 points. He dropped down from 7 when they conceded which is frustrating. My concern now is that Kane might start and do some damage. Kane set to start today, may course some concern. Huge concern, certainly didn’t expect him to start. Sanchez isnt good enough. Never looks like scoring. Will get left behind if you dont off load him. Not putting Kane in was a massive error if he gets going today its over. Not exactly a useful comment at this stage. If you felt so strongly about it why not raise it yesterday when it could have been discussed before a decision was made? Let’s hope Kane has a quiet game. No hard feelings just frustrated when utd conceeded & messed the good start up. Sanchez never looked like scoring though. It wouldn’t surprise me if he got two or more today. Trust me, no ones more frustrated than I am. Very frustrating – had enough in the bank to start with him as well. Everywhere I looked predicted he wouldn’t start. That’s the spirit KounterFitz, we might as well pack up and all go home hadn’t we…….crikey it’s gameweek 1 😂. It was a negative comment. Let’s see what happens with Kane & try & repair it if he whack’s 2 or 3 in. No worries fella. 👍🏻 I was frustrated that Pogba took the penalty to be honest as Sanchez was the top of the list to take it for this game by all accounts. Could have been a better start but I’d say 8 points from two players on that game is about par. Who’d have thought Shaw would score?!?! Think we dodged a bullet with the Spurs game. My worry now is Willian as he was the one I was considering going for. Will be interesting to see how much Shaw’s performance last night will have boosted his chances of holding down the first choice left back spot. Don’t get me wrong he was hardly flawless but put in a good account for himself. It’s only one game but would be good if he could get a decent run in the 1st team for our fantasy teams sake, and for the sake of him and Utd. Being a fan it’s about time we started seeing the best of him, bags of potential. He’s always going to be rotated with Young but will hopefully be more of a regular this season. One of the best attacking defenders in the league in terms of assist potential in my opinion. I think he should get an extended run on the first team. I’m also a Utd fan and I can’t stand the criticism he gets from Mourinho, yet he will always play Pogba, Sanchez and Lukaku regardless of their performances. I don’t think the way he’s treated him in the past will help his development. Oh no, I didn’t know you were a Utd fan. There is one team that I don’t like and that is Manchester United. They are so boring to watch. Only watched 45 mins on Friday night and I was bored. Give me a city or Liverpool game any time. Haha I’d use the term “fan” fairly loosely these days. I still follow them but I can’t say I’m inspired by how things are in football generally these days. Gone are the days where you don’t hear much about salaries or needing to be “happy” to play well. I’d rather go back to the days of players like Keane, Scholes, Neville and so on. Players seem to be all about personal gain these days rather than success for the team on the pitch. Mourinho doesn’t seem to be able to get the best out of players either and generally doesn’t come across like he’s enjoying it. I’m more a fan of football in general these days. Kane’s next 3 fixtures, upto 1st Friday in month are Fulham, Man-utd, Watford, depending on decision & who comes out for him, have funds to get him in, money left for Lowton or Shaw upgrades, I’m a Newcastle supporter so maybe they can turn this around. I heard Spurs struggled today, was that the case? Didn’t see the game but followed live commentary and from what I could gather the Spurs squad looked lethargic and Newcastle were unfortunate not to get something out of the game. Quite a few pundits said that Kane still looked burnt out and off the pace. I worry it may take Spurs until September to get the ball rolling again. It’s a difficult one with Kane. Don’t want to transfer him in too soon if it may take him another 2-3 weeks to get back on form but also don’t want to wait too long and get caught out by him firing a hat-trick in against Fulham or Watford..
It’s a tough one. Do we risk leaving him out? Sanchez didn’t look great. Frustrated with Sanchez. Looked pretty sharp in pre-season. Well rested not featuring in the World Cup but was poor Friday night. Lost possession more than any other player on the pitch. I am 90% sure I will swap Sanchez for Kane before next weekends fixtures. I’d rather take the risk with Kane not being 100% just yet than hope Sanchez has a big game. Also the fantasy ownership factor, with over 50% owning Kane. I’d rather swap and risk getting caught out by Sanchez picking up good points than wait to bring Kane in and see him grab 20+ points. Yeah I agree, Kane is going to get going at some point and it’s important to have him before he hits a big score rather than just after. People getting panicky, remember only game week 1! Yeah Marc people getting a little carried away, it’s a loooong season. Bit annoying that last night could easily have been a 20+point night but it happens. Did anyone check the leaderboard last night. Must have been people thinking they could make unlimited transfers until before today’s kick offs piling Utd and Leicester players in their squads.. bet they had a nice surprise this morning lol. General question. I can’t find the dream team rule for assists.. can someone fill me in on this? Sanchez was awarded an assist on FPL for being the last Utd player to touch the ball before the penalty was awarded which I thought counted as an assist but there is obviously a different rule for dream team? I’m assuming it only counts as an assist if it’s a direct pass leading to a goal. Kane off the pace today. Too early to draft him in yet until he gets some more game time under his belt? Thoughts? Tough one. Literally felt relieved today because I know so many people will have him. At some point he’s going to grab two or three in a game. Do we wait until this happens and stick him in or just get him in ASAP? When Sanchez didn’t get off to a flyer either I’m inclined to just stick Kane in at the earliest opportunity. I personally think you took the decision in going Hart and Lowton in terms of spreading the cost. So getting in Kane I believe is a better way to go and ultimately rewards your money saving. I personally went for a more expensive roster in getting Chelsea’s Kepa and Sanchez so won’t be able to get Kane yet. This possibly will bite me but you can’t have all the top players. Yeah exactly, he still needs to get the points though otherwise there’s no point in having him. I’m sure he will come good. DTT I actually think we are doing well, tomorrow I think will see us scoring handsomely . Obviously there is a big desision to make midweek, do we bring in Kane yet? Yeah can’t complain with Shaw getting a goal but last night could have been so much better. Kane not scoring today did us a favour as well but I’d rather have points on the board. Chelsea result wasn’t ideal and anyone with Richarlison will be happy. Just hoping City and Liverpool do the business tomorrow and the right players score. Really wanted a big start. Bad start for my team in DTT mini league but I did put in Richarlison. ARB90 mentioned about Sanchez not getting an assist for the penalty but Alonso must have got an assist for the penalty as he’s on 10 points. Where’s the consistency. I think it’s probably because it came off another defender before it hit the hand of the other one. There’s never been a lot of consistency though. Very early to make transfers I know but I’ve made two and feel a lot happier for it. I’ve taken Jota out for Richarlison. I think putting Jota in was a mistake for me and I didn’t look closely enough at Wolves fixtures, they have some tough games coming up. Everton meanwhile have some decent fixtures and I can see Richarlison bagging a few more in the next couple of months, I like the positions he takes up in the box. Always likely to get chances. The other change I’ve made is Sanchez for Kane. It will be a constant nag in my mind if I don’t do it and given Spurs reasonable fixtures within the first two months (barring Man Utd and Liverpool) I can see him bagging a few before long too. This is my first season playing dream team so I’m guessing mistakes from my part are inevitable. I’ll be leaving my last transfer of the month for any potential injuries, exclusions etc. PS Good luck with your teams for today guys. Big day for most of us I’d imagine. I’ll probably go for Kane. Although he didn’t play well, things can change dramatically from one game to another. I’m not sure I’d rush into another transfer just yet though. We are only in game week 1 so very early days. Im considering the same move from Jota to richarlison. Worried it’s a little early to be making changes and wouldn’t leave me money to upgrade Shaw to young. Id steer clear of Kane until September! DDT looking like a special gw1 for you, great brace by Mane with the city still to play. Thoughts ahead to gw2? Delighted with the game week – but also feeling “what could have been”. Clean sheet for Shaw, penalty and a goal for Sanchez, star man for Mendy, 7+ rating for Mahrez. All of these nearly came off but didn’t quite happen – could have been 20 points more to the total. Saying that – had a bit of luck with Shaw getting a goal so can’t complain. I’ll do a full post reviewing the game week and looking forward to game week 2. Great day so far, with City game to come, all 4 players playing, talking pts in days to come, kane’s fitness & sharpness, Sanchez’s enept performance, apparently when Hazard came on, he was on it straight away, how can we accommodate him with Mane off to a flyer. I think Sanchez can go but the question is Kane yet? Or even swap him for Hazard? B. silva was only going to be a short acquisition, Chelsea cover in the form of Willian, guaranteed gametime only half million more, Hazard out of reach at present, Richardson 2.5 million good fixtures to come. Maybe reconsider B. silva, cld be telling Mahrez came off for De bruyne. I didn’t see the game but read that they both did well. I think having both is too much but I won’t be rushing into taking anyone out yet. Good day 🙂 30 mins left of City game… hoping to keep the clean sheet and ideally a goal for Aguero… I know you like to judge your teams on the Overall Leaderboard DTT, but with so many teams with big blocks, I think for long term success, this is a great start to GW1 and a healthy standing on the Overall Leaderboard, as other teams will not be repeating their big scores every week! Very good day. Happy with the start. Onwards and upwards, hoping the momentum can continue. B Silva was a great choice, i doubt many have picked him. Agree with both points. B. Silva paid off and still makes sense to bring Kane in before he gets going. Haha I know, it’s a relief to get off to a good start. In particular doing well at the back is a highlight. Wow what an opening week for the defenders! If only Man Utd hadn’t have conceded in stoppage time, we would have had a full house of clean sheets on top of 3 assists between Mendy and Robertson and a goal for Shaw. Always nice to kick off the season with a good score in gameweek 1! Absolutely, don’t think we could have asked for much more from the game week. Hoping this momentum continues. Very good start. Odd that Mendy didn’t get star man with 2 assists from left back. Seems like an absolute beast and will have a great season. I was shocked he wasn’t star man. I didn’t see the game but Sterling must have had some game to get star man ahead of Mendy. Disappointed Mahrez didn’t get at least 3 points as well but agree it’s worth sticking with him for now. I’m not sure about Kane – I agree he was poor but he’s going to get going at some point. I’d rather have him in before he hits 2 or 3 in a game rather than just after. Only just joined your league. Sanchez, Aguero, Mahrez, Arnoe and Jota… not a single point between them!! Oh well, bring on GW2! I got caught out by the first three as well but overall a decent game week. Hoping for more of the same next week. I’ll keep the blog as up to date as possible, at the moment everything has gone to plan. Will post a review of the game week at some point and a look forward to next week. Good result today, I’ll post up a review of the game week at some point. Good opportunity to discuss game week 2 then but hoping for more of the same. Keeping Sanchez after last games display? Unlikely I’ll keep him but who comes in instead? I’ve got money in the bank for Kane but he arguably played worse than Sanchez. Yep, top of my mates league so I reckon this website could be invaluable to us all. As this is my first Dream Team, do you think I’m being too hasty to make two transfers already? (Jota out for Richarlison / Sánchez our for Kane). I’m considering reversing the Sanchez transfer for another week. Sanchez could get something away at Brighton? But then again Kane you could easily see Kane scoring against Fulham at home. I feel Jota has to go for now though looking at their next few fixtures. I’m sure his time will come further down the line though. Just really like the look of Everton’s fixtures the more I look at them. I’d reverse them both if you can. You don’t need to make them until just before kick off (as long as players don’t get locked out). You give yourself some extra thinking time and if you want to make them you still can – but nothing will change between now and the weekend so you won’t lose out by waiting to make the decision. I know Boyce, he looked nothing like the player he was at Arsenal did he. Just concerned I’m transferring too many too quickly? Or would you say it’s a good strategy to act quickly if something doesn’t look right ie Sanchez. Wish I’d have gone for Richarlison instead of Jota. Jota might need to take some settling in to life in the Premier League whereas Richarlison knows what it’s all about from his time at Watford. He’s been able to hit the ground running. Also, with better players around him at Everton he could be a really decent points scorer with some of the advanced positions he takes up. One option cld be, to keep a watching brief on Kane, 4-4-2, Hazard in. Chelsea do play Arsenal next weekend so not sure about moving for Chelsea players too quickly. I’ve reversed them. I’ll wait and see what the press conferences come up with on Thursday. Transfers need to be made before 07:00 on Friday for anyone thinking of making one. Don’t quote me on it but I’m fairly sure if we wanted to swap Sanchez for Kane. We could wait until 14:59 on Saturday because Sanchez won’t have played and Kane is just about to play. As long as neither player has kicked a ball I think the change can be made at any point. I had such a decent gw1 not likely to change anything yet. I went with the Liverpool trio, Mendy seems like he will provide good assists this season. I do have Stones for Man city coverage. I don’t have the funds for Kane went for a more balanced side as wasn’t comfortable with Burnley players. Defiently I have things to think about going forward. I’m glad I gambled with the 3 Liverpool forwards as it payed off in gw2. Thoughts? Can see Liverpool doing well again next weekend so think it was a good move. No price changes for a few weeks yet so it wouldn’t make any difference. So good to wait and see for now and not rush any transfers. It’s a no brainier to put Kane in for Sanchez if he’s playing this weekend though. As has been said, we can do this up until 2:59pm on the Saturday as neither Sanchez or Kane will have played in the gamewwek by then. I went for Sanchez as well, and kept money in the bank for Kane as I thought Sanchez would continue playing up top as he had been in pre-season. I was very disappointed to see both him playing on the wing, and his performance. We have to get Kane in before he does any damage. Not worth the risk of losing out on a potential Kane hat-trick when most of us have had such a good start. Yeah I’d imagine this will be my only transfer of the game week. Makes sense to go for Kane. Got off to a poor start myself but it’s only game week 1 so still full of optimism. Not my worst ever game week, that was when I got 4 points after the first weekend first time playing four seasons ago. I thought my team would get better the next week but then my team got 0 points. It’s very early stages and there’s a long way to go. I’d be happy for more of the same next weekend though. So a good majority thinking to put Kane in for gw2? He will likely start, also I believe Lukaku will take back the utd central role with Sanchez pushed out wide. Something worth thinking about. Yeah I think Lukaku could be slightly over looked this season. Should Aguero start getting rotated I may look to Lukaku for that position. A previous poster has indicated transfers must be made by 7 a.m. on Friday.My understanding is transfers can be made during the gameweek providing none of the two players concerned have played in that particular gameweek. Can anyone clarify? Alan, you are correct. So long as the team that the two players in question play for haven’t played yet, then you can transfer them in/out. It’s important to stress the ‘team’ part though, as it doesn’t matter if your player doesn’t play. 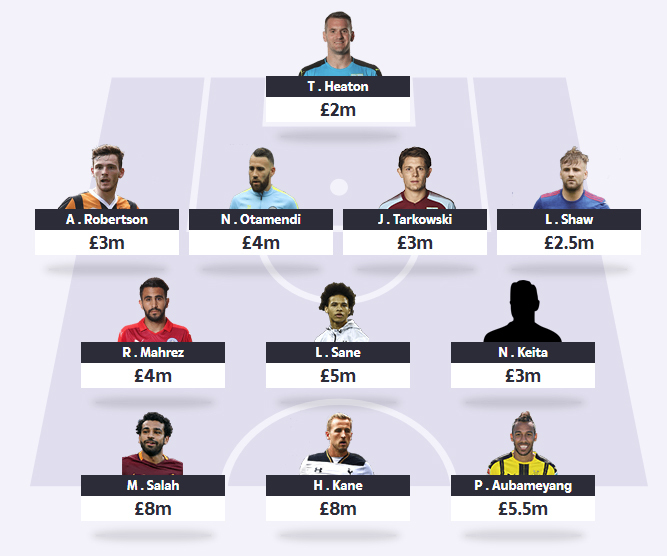 If the team that they play for has played in the game week already, then all players of that squad are both locked in to your team, and out of any transfers in for the current week. So, for example, if you have Zaha and it turns out he’s picked up an injury and not playing on Saturday at 12:30, and wanted to wait for the 3 o’clock team news to see if Richarlison is playing, you can’t do that. You would have to transfer Zaha out before the KO of the Palace game or else he would be locked in, even if he isn’t even on the bench (I’m not implying hat Zaha maybe injured by the way, it’s just an example). Thanks Chris.Yes the whether the player’s team has played in that gameweek is the significant factor. I think If he’s back and playing 90 mins you’ve got to get him in. If Sanchez had done well you might have a dilemma but I thought he had a shocker. He gave the ball away 23 times which was more than anyone on the pitch . . . Jose was visibly annoyed. Yeah completely agree with every point you’ve made. Putting Kane in is the only transfer I’m likely to make this week. I can get Kane in for Firmino if I go cheaper on my keeper who is Kepa or change Sanchez from spurs to someone cheaper. I do like Firmino but I believe as goals go Kane will be the one to go with. Any thoughts would be appreciated. It’s just deciding on who to replace to a cheaper defender or keeper? That’s a tough call. If you had the funds already in the bank it would be easier but having to lose another transfer and downgrade another player is a tricky decision. I’m completely 50/50 in terms of how well Kane might do at the weekend but I’d rather have him than not. Would take a bit of shifting players around. Who did you have in mind to come out? Can’t change Lowton to a City defender without changing a midfielder. Need some funds. Any suggestions? Oh yeah but I assumed we were bringing in Kane? Whisper it but remember when Kane scored a hattick against Fulham in the FA Cup. The omens are there potentially. Man City do have a nice run, Laporte is 3.5mil depends if he keeps otamendi out the team? Who would come out for Laporte? I think Kane is a must have to be honest. If I have lacazette up top in one of my teams and 6m in bank, do u reckon I should get Kane in and leave only 2m or stick in player like firmino in and be able to change Charlie Daniels to a city defender? If you want Kane at some point you may as well get him in. Any updates coming up before Saturday dtt? Only one I’m looking at is Kane in for Sanchez. Thoughts on this? I accidentally picked David Silva instead of Bernardo Silva but have I been lucky with the injury of kevin de bruyne or do you think he will not be involved in City’s next few games what would you do if you was in my shoes? I’d probably take him out for another Man City midfielder if he’s not playing at the weekend. I don’t think he will be either. Gutted I didn’t go with my instinct and swap Richarlison for Jota!!! Ah well, at least I benefited from the Kane sub!!.. Do you think you’ll still bring him in? I was tempted but I thought he had just had one good game. Surely he can’t keep it up? I don’t know, but Wolves shave City next and I can’t see Jota scoring too many points there! Meanwhile, Everton’s next fixtures are Bournemouth, Rotherham and Huddersfield! No Mahrez today! Tempted to sub in B Silva, but that will mean that my subs are all used by the weekend with 2 weeks to go till get anymore!.. Yeah I’m tempted by Richarlison now, although I still don’t think he will be up there with the highest point scorers at the end of the season. I can’t say I’m bothered about having B. Silva even though I’ve got him.